Also available in 150 ml. 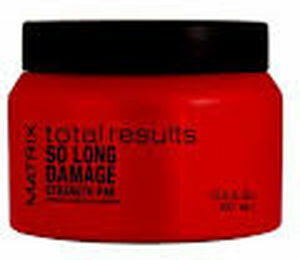 For those in need of even more powerful reconstruction or just targeted care for damaged hair, there's Matrix Total Results Repair Strength Pak Intensive Treatment. A deep acting masque that is fully capable of locating the most distressed and porous areas of the hair fibres and focusing its impressive care in returning core strength to each strand. The transformation will be easy to see, as a gorgeous lustre returns while hair health is being completely rejuvenated. The Mask takes advantage of Cuticle Rebond Technology. Exclusive to Matrix, the innovation is a combination of Ceramide and Amino Silicones, with the former taking the lead in penetrating hair fibres and filling the porous holes that weaken their very structure. The aforementioned silicone tackles the more apparent indicators of damage by completely resurfacing the exterior of each individual hair, sealing off the cuticles from further harm in the process.